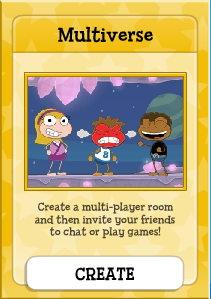 NOTE: This page hasn't been updated for the release of Poptropica Friends from early 2012. It's mostly accurate, but use at your own risk! The ultimate guide to high battle ranking and more Multiplayer room fun! This guide should help you with anything from battle ranking to chatting to seeing which rooms are most POP-ular. This is my guide to the games in your Games inventory (go to items, then select Games). Most only work in common rooms. I've also got video examples for almost all the games, just scroll down. Sometimes these can be tough and these tips are guaranteed to boost your battle ranking. Look for large clusters of similar fruit. These are most likely to have good bunches, and also you might make a move that makes the new fruits coming in will make matches all by themselves. If you see some fruits that are arranged like, say, with two next to each other and one off to the side, move that one in. An example of that is in the upper-left corner of the card (left of this.) 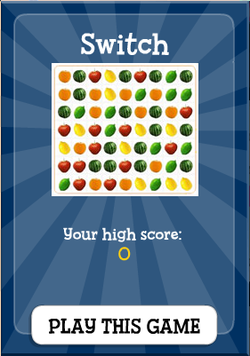 See how the watermelons are arranged? 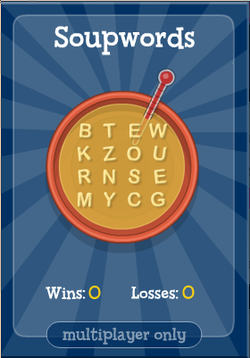 Fast thinking is crucial in this game for a legendary high score and also plenty of your own skill. Practice makes perfect! Also, this game can only be played outside a multiplayer room. 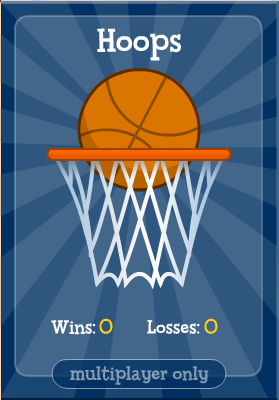 The main trick: keep your mouse on the bottom-forward corner of your own scoreboard, moving only if the hoop is higher than your cursor. Aim up when you shoot so that it will go very high, but not very far, and land in the hoop. The higher it is, the higher you aim. Act fast, the moment you get the ball, and if you miss then adjust your mouse position only a tiny bit for the next turn. This game can only be played in a multiplayer room, unfortunately. Sky Dive is the quickest game of all time. 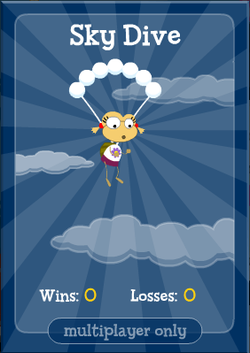 You click to jump off the cloud (when it says 'GO'; jump too early and the other player wins), and then click again later when you're falling to activate your parachute. Don't get too twitchy, though! And if you jump too late you'll be nothing but a shape on the ground. Jump immediately when you see GO. My trick is to just jump when you see something green on the screen. (Due to the multi-player nature of the game, you can technically click a fraction of a second before it says GO... but you can never know when it will say go. So back to square 1). Only activate your parachute when you start seeing the outlines of blue hills below you. Trust me, it's safe. Again, you can't play this game by yourself, only in Multiplayer rooms. Paint War is one of my very favorite games. 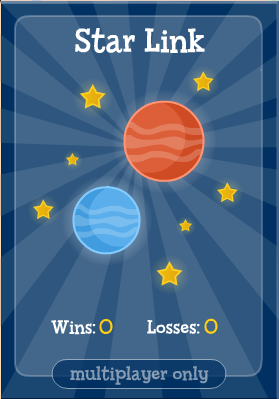 You click and drag your cannon to aim it against a balloon on the board, and then press down the FIRE button. The longer you hold it, the more power builds up. When you're ready, let go of the button and watch your paintball destroy balloons. The first person to pop 7 balloons is the winner! Always go for full power. This will take longer to charge up but it's worth it because it makes your aim more accurate. Also, there's one less variable to consider (power) so the reload time won't bother you. Aim straight at your target balloon, since your paintball barely drops if you launch at full power. Look at your opponent's cannon to see where they are aiming. If they are in the same place for a while that probably means they're building up power, so stay away because they will have already shot it by the time you get there. This is another multiplayer room only game. 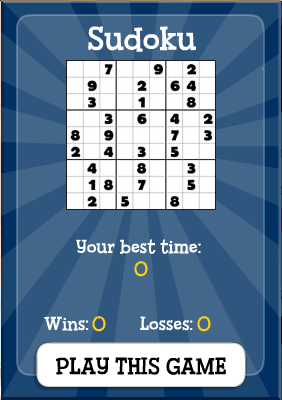 If there are two lines surrounding a box, don't make another one or your opponent will be able to finish the box! If you make a long chain of two parallel lines, then you can force the opponent to click inside it later in the game. This will set off a chain reaction where you can get nearly unlimited boxes. Make sure that when you have to click and let your opponent grab tons of points, you look for other paths that may have less points, and you click there. Always go for closing a path that's longer. These instructions may be a bit tough to understand at first. Now you get why Star Link is so tough! This is another multiplayer room-only game. 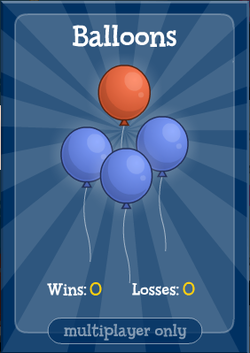 Balloons is a lot like Connect Four. This time you're using balloons, and they don't drop in, but rise in. You click on a nozzle to blow up a balloon. You need to make a row/column/diagonal pattern of 4 to win. Be careful, if you wait too long you lose your turn! The most important trick of all: BLOCK YOUR OPPONENT!!! If you stick by this it's no harder than Tic-Tac-Toe. But don't block in advance. Then you're hosing yourself. Block them just before they can win the game. Only playable in a multiplayer room! 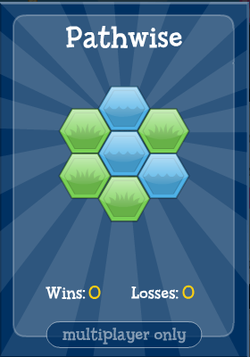 Make a path to the other side by clicking on blank areas to place tiles. Water needs to reach water, grass to grass, but beware, your path can be blocked by other people! There is also a trap, when the other person is only one tile away and it's your turn. This way you can't even block. If your turn is first, you have an advantage because you can reach first, even if they play a perfect game (but only if you do, too). Try blocking a little bit ahead of their path. Predict where they may go, and if you do you can also make a bridge for yourself. The video shows an example of this. This one is my favorite. It's also a game you have to play to beat Wimpy Wonderland Island, and you can play it alone. There are three waves of ogres you have to protect your wizard from. At the start of each wave you have 30 seconds to build walls by clicking where you want to place blocks. SPACEBAR rotates them and if you completely surround your wizard, the inside of the fort turns purple. Now when the ogres come you have to click to zap them away before they have chance to break the walls and reach your wizard. 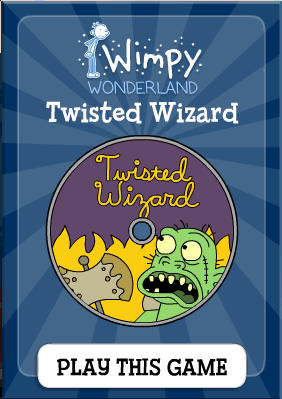 Easy mode is turned on by clicking on the wizard before starting the game, but it can only be activated after Greg has enabled cheats in Wimpy Wonderland. Build walls fast and take advantage of being able to rotate blocks by making them fit snugly. Try hard to get the wizard completely surrounded with a thick, uniform layer. Zap the ogres in this order: first the ones that are breaking your walls, second the ones that are really close, and lastly the ones far away. Be careful, as you reach higher waves it quickly gets harder (in normal mode) so make your walls really thick to avoid shooting so much. Well I'm no good at it, so I'd have to defer it to these guys. Good luck! You can play it alone. Chatting is fun, but it can bore many people. To chat, open the Chat tab on another player and select a question out of the three. Click the Chat tab again if you don't like the given options. They will answer back from a list pf three pre-scripted answers, as can you when they ask. Friends is a feature probably coming soon to Poptropica. For a few days, there used to be a new tab, called Friend, that showed up above another Poptropican. Right now it doesn't work, but it looks exciting! I also suspect we may be able to invite friends to Multiverse and to our own rooms (when we get them!) For now, it's virtually impossible to keep track of anyone, because your player names are not unique. Cross your fingers we'll get this cool new feature soon! Emotes (see below) can help keep someone playing with you for longer. So Poptropica Friends ended up releasing after all. I'll update it soon! You may have noticed four little heads poking out of the screen at the right. These are emote buttons, that cause your player to do different things (like crying) or show emotions (like angry, proud, and happy.) These have the potential to be rude, especially while chatting, so think of them as your physical body language. Also, you can use the Emotes Balloon and and Feelings Potions for more wacky emotes! Naturally, the room from the latest non-Member island will be the most popular... but for some reason people always come back to the Soda Pop Shop on Early Poptropica. It's always jammed. 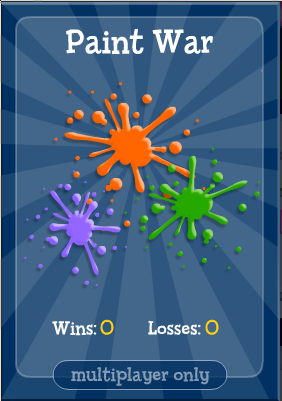 On the rare occasions when there are no ads, the Arcade appears on Early Poptropica, and it is not nearly as popular. If you want some good costumes, look to the multiplayer room of the island that has that theme.